The Leaping Wolf Badge is a challenge to every Cub. You may work for it while you are still doing your Gold Wolf during your final year in the Cub Pack. To earn this badge, you will have to work on your own, in your own time, to plan and do things and record what you have done. for yourself. Your Pack Scouters and parents are there to help you and advise you, but you must do the work yourself. This will help prepare you for the Scout Troop, where you are expected to be independent. Plan and carry out a planting project at your Scout Hall or in your community, OR earn the Food for Life badge. Make a knotting display showing all ten knots you have learnt. Undertake a personal challenge in connection with your school or home or social life. Note: This requirement must be discussed with both parents and Pack Scouter before a final decision is made. Find out about a technology of your choice. Understand its basic functions, how it is used and a brief history. Present your findings to the rest of the Pack. Find out about a global issue such as poverty, conservation or water and sanitation and what you can do to help. Complete a log book recording your Leaping Wolf Challenge. Earn the First Aid and Health interest badge and any two of the Cub Interest Badges below. To earn your Leaping Wolf, you must complete all the requirements of the Gold Wolf Outdoor Challenge. You don't have to complete the entire Gold Wolf. See Gold Wolf Outdoor Challenge. People like to live where there are trees and flowers. In consultation with either your Pack Scouter or local municipality, you could plant some flowers, shrubs or trees in the Scout grounds or a local park/school grounds. Think about how your project can encourage bird life, insect life, be water wise, and create an ecosystem, e.g. rocks or bark for lizards and spiders, indigenous flowering plants to attract birds and insects. Perhaps you would like to earn the Food for Life badge. There is a special booklet which will give you all the requirements plus ideas on how to make your own gardening implements and when to grow certain vegetables. Ask Akela to get you a copy of the booklet. Remember plants take time to grow, and gardens take time to mature, so this should be one of the first items you start for your Leaping Wolf. You won't be able to start this one month before you turn 11, and still expect your garden to be ready or to harvest your Food for Life crops! In Scouts you will start building all sorts of constructions at camp. This is called pioneering. To be successful at pioneering you need to know which knots are used and how to tie them correctly. Can you remember how to tie and use all the knots you learnt on your Cubbing Trail? Here is a chance for you to take on and experience something really new and challenging. Perhaps there is something you have always wanted to do, or hoped you could do, but never got around to trying it? Think about it. What would you really like to do? Look over an ocean going ship? Milk a cow or herd a flock of sheep? Take part in a play? Learn how to use a camera? Learn how to play chess? There are many other activities you could do BUT remember: Whatever you choose must be something that is possible for YOU to arrange and do, possibly with the help of adults. Akela may advise you, but YOU must make the enquiries and arrangements. Most things will take time to arrange, so start planning early. Don't leave everything until the last moment and then have to do them in a rush. After you have achieved what you planned, say thank you to those who have helped you. Share your new experience with others in the Pack by telling them all about it. Find out about a technology of your choice. This could be a personal computer, a car engine, an aircraft, cell phone or anything similar. Understand the basic functions of the technology and how it is used and a brief history. Present your findings to the rest of the Pack. There have been many changes and advances in all aspects of technology in this and the last century, and these advances affect each and every one of us. To have a better understanding of how stuff works, pick a technology that interests you, and find out more about it. Think of what you would like to tell the other Cubs about it, and explain to them why you think it is interesting and important. Make sure you don't just copy and paste what you find on the internet or in a book - it must be your understanding of the topic. Currently the world is challenged with many problems. By encouraging all of us to learn more about issues affecting the world we can become more aware of the problems and challenges and help to combat them. This logbook is your personal record of the various challenges you have undertaken along the way to your Leaping Wolf. You can use an exercise book or a folder or a file of plastic sleeves, and you can hand write it or type it on a computer, but whatever you do, make sure it is your own work, and "do your best". For each challenge, include the date when you completed it, and describe things like why you chose to do it the way you did, what you learnt along the way, and how your challenge helped other people. Along the way, take it to Akela to show how you are getting on, and get your Akela's suggestions about how you can improve it. Illustrate your logbook with drawings or photos, and use your imagination to make it something you will be proud to show your Akela and other Cubs. Look at the requirements for the badges carefully before you decide which two you would like to do (Civil Emergency, World Friendship, Linguist, Outdoorsman, Religion and Life or World Scout Environment) in addition to First Aid and Health (compulsory). Each prepares you for something special – to be of service to others or to become a better person. 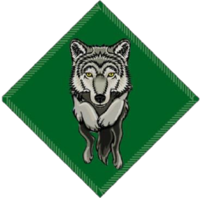 The Leaping Wolf Badge is awarded nationally, and all requirements must be completed and the logbook submitted, together with the Leaping Wolf Application Form completed by the Pack Scouter, all before the Cub's 11th birthday. Late entries will not be accepted. It is best if the Cub completes all the tasks and hands in their Leaping Wolf logbook well before their birthday, to allow time to sort out anything that needs to be changed before their 11th birthday. The Pack Scouter is the first assessor, and they must ensure that the Cub has completed everything and got their applications in on time. The Pack Scouter must also approve the standard of the badge according to their knowledge of the ability of the Cub. The Pack Scouter must complete the application form and submit this together with the logbook to the responsible person in their District or Region. The application form must reach the national office no later than 1 month after the Cub's 11th birthday. The logbook does not have to be sent to the national office, and can be returned to the Cub. Leaping Wolf Camps are not suitable, as the Cubs have no input in the planning of the tasks they would like to complete. This defeats the purpose of planning and executing, and turns the process into a production line and the Cub will never own it. This page was last modified on 26 March 2019, at 08:39.